While I have been doing some minor baking, I haven’t posted because my camera-computer communication system seems to have broken down. In other words, I don’t know what I’m doing if the slightest thing goes wrong or doesn’t work. But, somehow, I’m back on track. Also, as I may have mentioned previously, due to a tumble I took in Hawaii 2 years ago, I have to use more of the electronic conveniences than I did before. At first—and for some time—this bothered me and I didn’t feel like baking. I’m getting over that phase and have decided to embrace the modern. For example, that means no—or very little—hand kneading, which had been something I very much enjoyed. But this recipe for Banana Nut Muffins with Spelt and Emmer Flours, is from a spoon bread recipe anyway. No kneading required. The following is a take-off on the Banana Bread recipe in The New Laurel’s Kitchen (1986, page 317). I liked it because she only used whole wheat flour. No white flour. I used spelt and emmer flours in my rendition. Put 12 muffin cups into muffin pan. Cream softened butter and sugar with mixer at medium speed. Sift together the flours, salt, baking soda, and baking powder. Add to sugar mixture and mix thoroughly. Add mashed bananas and lemon juice and mix until well blended. Divide dough evenly in 12 muffin cups. RESULTS: As you might be able to tell from the photograph, the muffins have lots of nuts in them. They are also moist because I kept the bananas roughly mashed. If you look carefully at the photo, you might be able to see some banana in the muffin. These can be eaten with butter, but are also tasty without anything on them. This is the second batch I’ve made in less than 2 weeks, so I can vouch for them! If you have a whole grain bread or dessert recipe you’d like to share, please let us know what it is. It’s always fun to learn about new and healthier breads, muffins, and other treats. 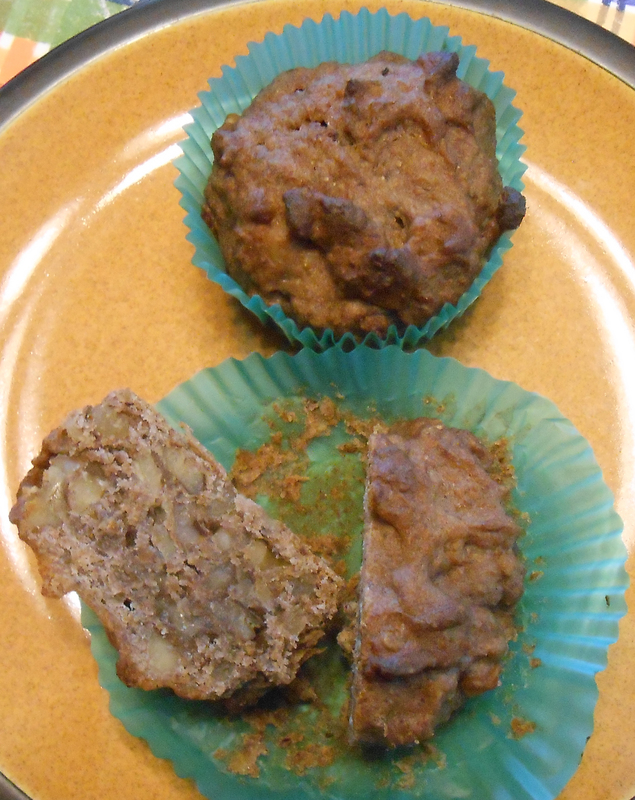 This entry was posted in Baking, Process and tagged banana nut muffins, Emmer Flour, spelt flour, whole grain baking. Bookmark the permalink.